Breakdown maintenance still accounts for much of the time maintenance workers put in. Too often, the result is lost revenue, excessive downtime, and poor-quality repairs. 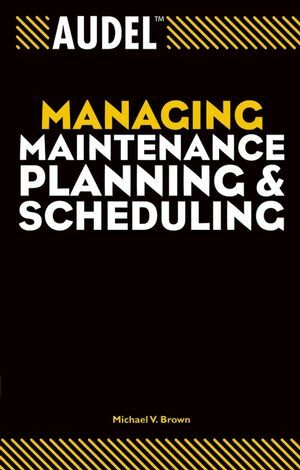 This convenient, practical guide shows you how to develop a comprehensive planning and scheduling effort to ensure all resources are available when they are needed. You'll discover how to gather supportive data and build plans that will help you control maintenance costs and equipment downtime. Michael V. Brown is an electrical and maintenance engineer with 30 years of experience in industry, and has held positions at both the plant and corporate levels of Fortune 500 companies. As founding partner and president of New Standard Institute, he has designed and implemented maintenance management improvement programs for numerous industrial clients. New Standard Institute provides seminars, consultations, and computer-based training programs specific to maintenance-related subjects. For more than a decade, he has written articles that have been published in many U.S. and Canadian magazines, as well as on the Internet. Other books he has written and published by Wiley include Audel Managing Maintenance Storerooms and Audel Managing Shutdowns, Turnarounds, and Outages. Chapter 1. Defining the Level of Maintenance. Chapter 3. Planning and Estimating Electrical Work. Chapter 4. Understanding Preventive and Predictive Maintenance. Chapter 6. Planning for Shutdowns, Turnarounds, and Outages. Chapter 7. Gathering Data for Maintenance Performance Indices. Chapter 8. Using Indices to Measure Performance. Chapter 9. Using Multiskill Training. Appendix A: Identifying Electrical Work to Be Performed During a Shutdown.